Elusive dark matter around clusters of galaxies often clumpsinto cigar shapes, new observations show. The discovery could help scientists finally understand whatmakes up darkmatter, which is the mystifying stuff thought to exist invisibly all aroundus. Dark matter, which could be more than five times more abundant than visiblematter, is only detectable through its gravitational pull on regular material. According to the new observations, the dark matter aroundmany galaxyclusters is a flattened, cigar-like shape, rather than a rounded sphere. "There are clear theoretical predictions that we expectdark mater haloes to be flattened like this," said study co-author GrahamP. Smith of the U.K.'s University of Birmingham. "It?s a very beautiful,very clean and direct measurement of that." 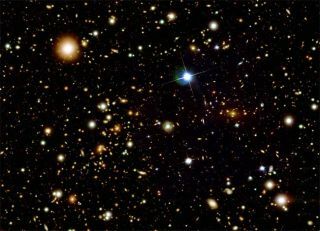 Smith and the team, led by Masamune Oguri of the NationalAstronomical Observatory of Japan and Masahiro Takada at the University ofTokyo, used a quirk of gravity called gravitational lensing to observe darkmatter's gravitational effects on large collectionsof galaxies known as galaxy clusters. Gravitational lensingoccurs when mass warps space-time, causing light to travel along a curved pathwhen it passes by. The amount of curving can tell astronomers how massivecelestial objects are. For this study, the researchers used the Prime Focus Cameraon the Subaru Telescope on Mauna Kea in Hawaii to observe 20 galaxy clusters.They took advantage of gravitational lensing to create maps of the distributionof mass around the clusters, thus getting a peek into the secrets of darkmatter. "What we're probing with these gravitational lensingobservations is the dark matter distribution, because the dark matter dominatesthe mass on these large scales," Smith told SPACE.com. The fact that the dark matter seems to be flattened out intooblong shapes fits in with the so-called cold dark matter theory. Computersimulations based on this theory have predicted such shapes, but they havenever before been verified to such an extent with so many large clusters. The findings could shed light on the fundamental nature ofthis weird stuff, which scientists cannot detect directly. The observationssupport the possibility that dark matter is actually made of tiny particlescalled WIMPS(weakly-interacting massive particles) that exert a strong gravitational force,but otherwise don't interact with normal matter. The research will be detailed in the Monthly Notices of theRoyal Astronomical Society.